For other ships with the same name, see USS Skate. USS Skate (SSN-578), the third submarine of the United States Navy named for the skate, a type of ray, was the lead ship of the Skate class of nuclear submarines. She was the third nuclear submarine commissioned, the first to make a completely submerged trans-Atlantic crossing, and the second submarine to reach the North Pole and the first to surface there. The contract to build her was awarded to the Electric Boat division of General Dynamics on 18 July 1955, and her keel was laid in Groton, Connecticut on 21 July 1955. She was launched on 16 May 1957 sponsored by Mrs. Lewis L. Strauss, and commissioned on 23 December 1957 with Commander James F. Calvert in command. Skate conducted shakedown training out of New London, Connecticut until 29 January 1958, when she cruised to the Bermuda operating area, then returned to her home port on 8 February. Sixteen days later, the nuclear powered submarine set a course for the Isle of Portland, England. Before returning home, she had also visited ports in France and the Netherlands. On 30 July, Skate sought the Arctic where she operated under the ice for 10 days. 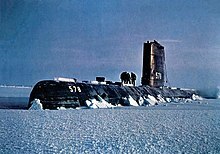 During this time, she surfaced nine times through the ice, navigated over 2,400 miles (3,900 km) under it, and on 11 August, 9:47 pm EDT  (the week after USS Nautilus) became the second sea ship to reach the North Pole. Skate was unable to surface precisely at the Pole on the August voyage due to dangerous ice conditions as noted in the captain's 1960 book, Surface at the Pole: The Extraordinary Voyages of the USS Skate, where Calvert said, "Seldom had the ice seemed so heavy and so thick as it did in the immediate vicinity of the pole. For days we had searched in vain for a suitable opening to surface in." The closest was to make radio contact at the surface from a polynya around 30 nm away, but not to surface fully owing to the risk of damage from ice. Skate did manage to surface and make contact with Drifting Ice Station Alpha at 85ºN, 300 nm away. After being denied access to visit Copenhagen in Denmark, she sailed into Bergen, Norway on 23 August. There she was inspected by king Olav V of Norway, US ambassador Frances E. Willis and minister of defence Nils Handal. The submarine made port calls in the Netherlands, Belgium, and France before returning to New London on 25 September 1958. In recognition of the dangerous and historic feat, the Skate and its crew was given the Navy Unit Commendation award for "... braving the hazards of the polar ice pack...."
While the Skate was unable to surface on its first voyage to the pole, on 17 March 1959, she became the first submarine to surface at the North Pole with Calvert describing the historic moment in his book, saying, "Slowly we blew the tanks and the Skate moved reluctantly upward. It was apparent we were under heavier ice here than any we had experienced before." While at the pole, Calvert and the crew planted an American Flag in a cairn they built out of ice blocks and put a waterproof container in the cairn with a note commemorating the event. The crew also held a ceremony for the late Arctic explorer Sir Hubert Wilkins and committed his ashes at the pole. In 1931, Sir Hubert had conducted an Arctic expedition in the disarmed research submarine Nautilus (ex-USS O-12). After reaching the Pole, the Skate continued its mission to pioneer arctic operations during periods of extreme cold and maximum ice thickness. When the submarine returned to port, she was awarded a bronze star in lieu of a second Navy Unit Commendation for demonstrating "... for the first time the ability of submarines to operate in and under the Arctic ice in the dead of winter...." In the fall of 1959 and in 1960, Skate participated in exercises designed to strengthen American antisubmarine defenses. Skate returned to General Dynamics in January 1961 for a regular overhaul and to have her reactor refueled for the first time. She put to sea in August and, for the next 11 months, conducted exercises to increase the operational readiness of her crew. On 7 July 1962, Skate again set course towards the North Pole. Five days later, USS Seadragon, did likewise from Pearl Harbor. The two submarines made their rendezvous on 31 July. After meeting, they operated together for over a week. Both submarines surfaced at the North Pole on 2 August and official greetings and insignia of Submarine Force Atlantic Fleet and Submarine Force Pacific Fleet were exchanged. Skate returned to New London and performed fleet and local operations for the next several years. She entered the Norfolk Naval Shipyard on 28 April 1965, the first nuclear submarine overhauled there, for nuclear refueling and installation of the SUBSAFE package. Skate was the first submarine to finish this major conversion program, which was instituted after the loss of USS Thresher in 1963. The process was not completed until September 1967. After sea trials and a shakedown cruise in the Caribbean, the submarine returned to New London and participated in exercises involved in the development of new undersea tactics and equipment. In October 1968, Skate was deployed to the Mediterranean where she operated with the Sixth Fleet for two months. The polar veteran operated under the Arctic ice again in March and April 1969, in October 1970, and in February 1971 . The remainder of her at sea time was spent in various Atlantic Fleet and NATO exercises. In July 1971, she began her third regular overhaul at the Norfolk Naval Shipyard and did not return to New London until 17 November 1973. In August 1974, Skate operated as a unit of the Atlantic Fleet. In late 1977, Skate transferred to Pearl Harbor, where she joined the other three Skate class submarines as a member of Submarine Squadron 7. Skate was decommissioned on 12 September 1986, stricken from the Naval Vessel Register on 30 October 1986, and disposed of by submarine recycling at Puget Sound Naval Shipyard on 6 March 1995. Skate appears in Tom Clancy's 1993 novel Without Remorse. Skate appears in the 1961 film, Parrish as the submarine upon which the title character is stationed. The 1978 disaster film Gray Lady Down features a fictional Skate-class submarine USS Neptune. Wikimedia Commons has media related to USS Skate (SSN-578). ^ a b c d e "Welcome Aboard USS Skate" (PDF). USN. ^ Rindskopf, Mike H. (1994). "Steel Boats, Iron Men: History of the U.S. Submarine Force". Turner Publishing Company. p. 71. ISBN 978-1-56311-081-8. ^ a b Calvert, James, Vice Admiral USN Ret. (1996) . Surface at the Pole. Annapolis, Maryland: Bluejacket Books. pp. 93–95. ISBN 1-55750-119-X. ^ Calvert (1960), p. 92. ^ Calvert (1960), p. 101–108. ^ Calvert (1960), pp. 184–186. ^ "Afterwards: USS Skate surfacing at the North Pole, March 17, 1959. Wilkins 35-5-1". Ohio State University Libraries Exhibition Under the North Pole. USS Nautilus (SSN-571) was the world's first operational nuclear-powered submarine and the first submarine to complete a submerged transit of the North Pole on 3 August 1958. USS John Marshall (SSBN-611) was an Ethan Allen-class submarine, the only ship of the United States Navy to be named for John Marshall (1755–1835), the fourth Chief Justice of the United States. Originally a fleet ballistic missile submarine designated SSBN-611, she later was reclassified as an attack submarine and re-designated SSN-611. USS Tullibee (SSN-597), a unique submarine, was the second ship of the United States Navy to be named for the tullibee, any of several whitefishes of central and northern North America. USS Tang (SS/AGSS-563), the lead ship of her class was the second ship of the United States Navy to be named for the tang. USS Sargo (SSN-583), a Skate-class nuclear-powered submarine, was the second ship of the United States Navy to be named for the sargo, a food and game fish of the porgy family, inhabiting coastal waters of the southern United States. 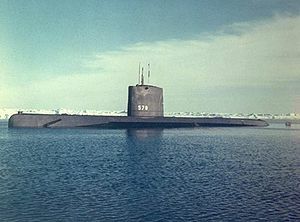 USS Skipjack (SSN-585), the lead ship of her class of nuclear-powered attack submarine, was the third ship of the United States Navy to be named after the Skipjack tuna. USS Scamp (SSN-588), a Skipjack-class nuclear-powered submarine, was the second ship of the United States Navy to be named for the scamp, a member of the serranidae family of fish. USS Shark (SSN-591), a Skipjack-class submarine, was the seventh ship of the United States Navy to be named for the shark. USS Jack (SSN-605), a Permit-class submarine in commission from 1967 to 1990, was the second ship of the United States Navy to be named for the jack, a name of fish applied to any young pike, large California rockfish, or green pike or pickerel. She saw extensive service during the Cold War. USS Whale (SSN-638) was a Sturgeon-class submarine nuclear-powered attack submarine of the United States Navy. She was the second ship of that name, after the whale family of aquatic mammals. USS Pintado (SSN-672), a Sturgeon-class attack submarine, was the second ship of the United States Navy to be named for the pintado, a large mackerel-like fish, whose elongated spots suggested the Spanish language word meaning "painted." USS Tautog (SSN-639), a Sturgeon-class attack submarine, was the second ship of the United States Navy to be named for the Tautog, a wrasse commonly found along the Northern Atlantic coast. The submarine was in service from 17 August 1968 to 31 March 1997. USS Sturgeon (SSN-637), the lead ship of her class of nuclear-powered attack submarines, was the third ship of the United States Navy to be named for the sturgeon. USS Spadefish (SSN-668), a Sturgeon-class submarine, was the second ship of the United States Navy to be named for the spadefish, a spiny-finned fish found in coastal waters of the western Atlantic from Cuba to Cape Cod. USS Ray (SSN-653), a Sturgeon-class attack submarine, was the second ship of the United States Navy to be named for the rays. USS Silversides (SSN-679), a Sturgeon-class attack submarine, was the second ship of the United States Navy to be named for the silverside, a small fish marked with a silvery stripe along each side of its body. USS Lapon (SSN-661), a Sturgeon-class attack submarine, was the second ship of the United States Navy to be named for the lapon, a scorpionfish of the Pacific coast of North America. USS Charlotte (SSN-766), a Los Angeles-class submarine, is the fourth ship of the United States Navy to be named for Charlotte, North Carolina. The contract to build her was awarded to Newport News Shipbuilding and Dry Dock Company in Newport News, Virginia on 6 February 1987 and her keel was laid down on 17 August 1990. Sponsored by Mrs. Mary McComack, she was launched on 3 October 1992 and commissioned on 16 September 1994. She arrived at her homeport of Pearl Harbor on 17 November 1995. James Francis Calvert served in the United States Navy, where he commanded USS Skate, the third nuclear submarine commissioned and the second submarine to reach the North Pole, which became the first to surface at the pole. Skate surfaced at the North Pole on 17 March 1959 to commit the ashes of the famed explorer Sir Hubert Wilkins to the Arctic waste. He later served as the 46th superintendent of the United States Naval Academy.